Earlier this year, Zack Academy was approved by the EPA as a provider for the online version of the EPA Lead Renovator refresher course. When taken online, the refresher course renews an EPA Lead Renovator certification for 3 years, after which an in-person refresher course must be attended to continue the certification. Several US states are approved by the EPA to run their own lead paint renovation program, which the EPA refers to as "EPA-Authorized" states. Several of these states are not yet recognizing the online refresher as a viable renewal option, or require additional steps to be taken after the online course, so it's important to be aware of your local requirements prior to registering for training. In this post we will be reviewing the steps required by the EPA-Authorized state of Washington in order to take the online version of the RRP refresher course. 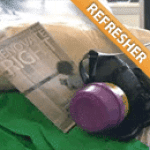 Register for the Online Lead Renovator Refresher course. Complete the course and pass the final exam prior to your previous expiration date. Receive certificate of completion from Zack Academy via email. Submit a Firm Application to WA to Register or renew your WA Firm Certification. If you work in EPA enforced states, make sure to register your firm with EPA as well at https://www.epa.gov/lead/getcertified (See step 2). If you work in OR or other EPA-authorized states, check with that state for additional eligibility and registration requirements. Alternatively, you can take the course in person to skip the reciprocity application and $25 fee. This will also renew your certification for 5 years, as opposed to 3 years with the online course. As of April 2010, anyone who performs qualifying renovation, repair, or painting (RRP) work on housing or child-occupied facilities (daycares, schools, etc.) that were built before 1978 must comply with the Lead RRP Rule. The law requires that companies performing this type of work must be registered as a Lead Safe Firm with the EPA ($300 fee) or an EPA-authorized state (fees vary), and at least one person supervising the work must be a Certified Renovator, which is achieved by taking the 8-hour Lead Renovator Initial Certification Course. Renewal of the Certified Renovator training course is required by the EPA, by taking a 4-hour refresher course prior to expiring.